New PE offers from the Middle East were revealed with monthly decreases in Turkey last week while initial price levels failed to see acceptance from buyers as per ChemOrbis. Several converters found the price reductions unsatisfying and justified their views with falling upstream costs, muted trade on a global level and internally, volatile economic conditions stemming from the foggy post-elections scene within Turkey. This forced Middle Eastern sources to apply a second round of decreases this week. Additional decreases centered on $20-40/ton compared to last week. 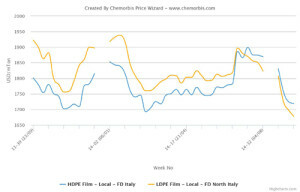 “We have mostly sold out our August LDPE, LLDPE and HDPE film allocations this week after conceding to additional decreases,” reported a source from a Middle Eastern producer. The supplier had initially approached the market with rollovers to $30-40/ton declines early last week before cutting their offers by another $40/ton for all grades in response to stiff resistance from players. A Middle Eastern major, who returned with $50/ton monthly drops for August for prompt materials from a bonded-warehouse, implemented another decrease of $20/ton for LLDPE film and $30-40/ton for HDPE film this week. A source from a global producer reported that they reduced their August prices for Middle Eastern origins by around $50-100/ton, while complaining that deals remain scarce. “We would probably need to go below $1300/ton CIF before being able to conclude deals with large buyers,” he commented, predicting that prices would remain soft into September. “We received a firm bid at $1280/ton for LDPE film, but we have not decided how to respond as it is well below our current list prices, which we had lowered $10/ton last week. We are willing to negotiate for firm bids but there are not many inquiries in general for now,” a source at a different Middle Eastern producer explained. According to ChemOrbis, a regional supplier also lowered their August offers for HDPE film and blow moulding from a bonded-warehouse by $20/ton this week. Last week, the seller had revealed new list prices $20/ton below their previous sell ideas.